Next month, thousands of bikers in Canada and the U.S. will be riding to raise money for refugees. The event, called Ride for Refuge, takes place in more than a dozen locations in the two countries (and at least one location in Australia), and will raise money to assist refugees and others in need of refuge both locally and overseas. The proceeds will be distributed to more than 200 churches and charities. 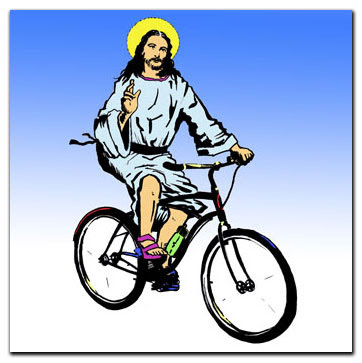 Biking for refugees - Please, if you are not divine, wear a helmet. The Ride was begun in 2004 by members of International Teams Canada, a Christian missionary group, and has thus far raised over $1.5 million. This year, they hope to have 7,000 riders and raise an additional $1.5 million. The Ride for Refuge is not the only Christian organization riding to help refugees. The South West Times reports that on October 3rd, parishioners from the First Christian Church (Disciples of Christ) in Liberal, Kansas will be traveling 900+ miles to Texas to deliver goods and money to refugees there (though it does not appear they will covering the 900 miles by bike!). The fund raiser was begun in 1979 by Feliberto Pereira, a Cuban refugee who wanted to help others in his predicament. According to the South West Times, this will be the last year for the refugee ride, which ends at the Southwest Good Samaritan Ministries, a refugee center located near the Mexican border. In an age of increasing anger and xenophobia, it’s nice to see people who take the gospel seriously and who walk the walk. And pedal the bike.